In the Internet Age, where it is as if nothing remains unknown to the masses, almost remarkably there exist hidden gems when it comes to golf courses. The world-class second green at Bellows Falls Country Club. They often come in the form of 9-hole layouts since a significant majority of golfers can’t be bothered to play anything less than 18. 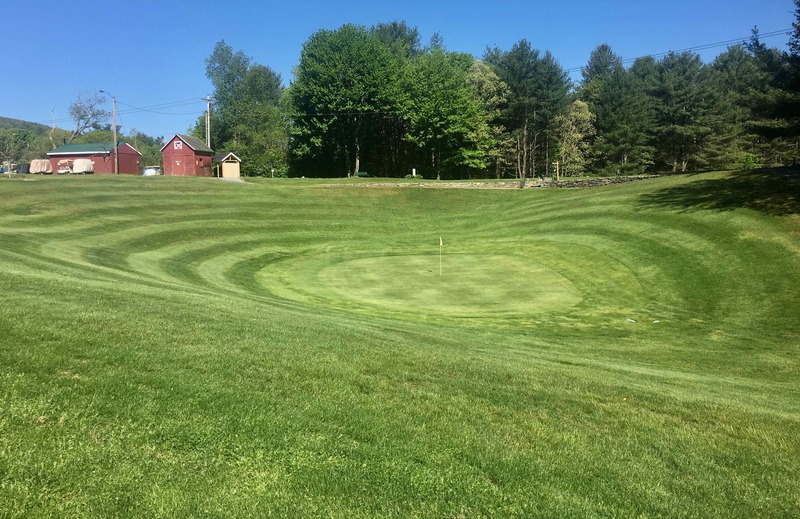 My friend John Moore and I stumbled onto one such jewel recently when we teed it up at Bellows Falls (Vt.) Country Club, which traces its beginnings to 1922. In no uncertain terms Bellows Falls is a must-play for fans of golf architecture and those who seek out enjoyable, challenging layouts. The course opens with two fabulous holes and continues with a solid series of par-3s, par-4s and a par-5. There is not a clunker among them. 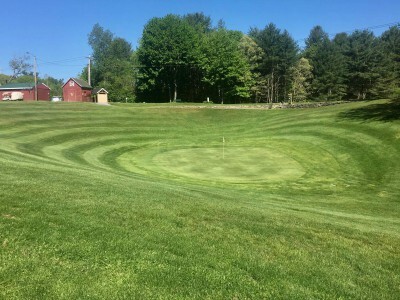 If that’s not enough to get golfers to Bellows Falls,located about 30 miles north of Brattleboro, Vt., the fact it is a mere 12 miles from Hooper Golf Club in Walpole, N.H., which I rate as the seventh-best North American nine-holer in my book The Finest Nines, should be. Who designed Bellows Falls remains out of view for now. Recent research by the club determined a course was contracted in 1941, just prior to the start of the Second World War, to upgrade the layout. The work was implemented once the fighting was over. The lauded architect team of Wayne Stiles and John Van Kleek, designers of Hooper, appeared on a list of potential candidates discovered in the club archives. Also included was architect/superintendent Skip Wogan and an unfamiliar person in J.N. Lewis of Planville, Conn., who had the word “builder” written next to his name. Whoever the club brought in knew a thing or two about sound design. 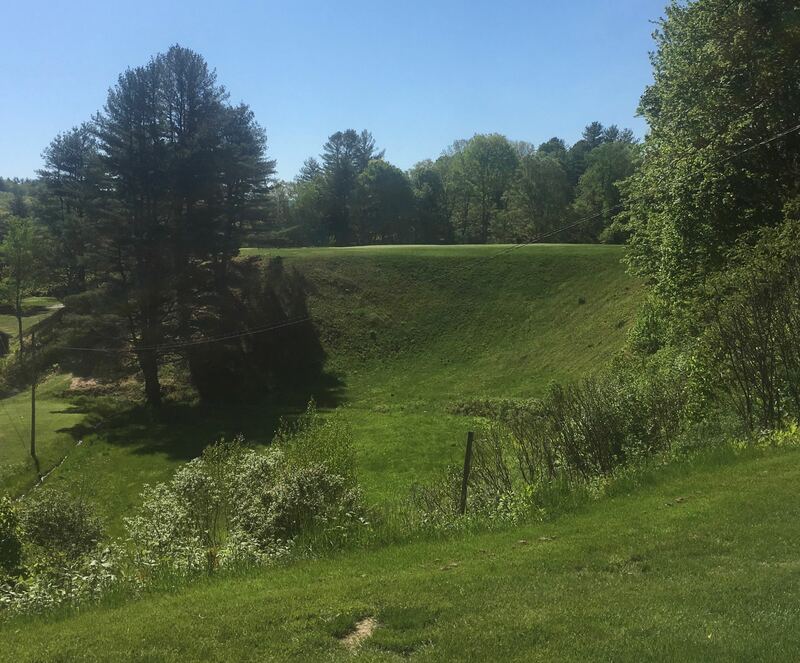 The Bellows Falls course opens with a wonderful rolling, downhill, dogleg left par-4 of 388 yards. The right side is banked high and when the ground is firm the feature just about begs golfers to play a long run-on approach shot off of it. The green sets up to receive a well-played bump-and-run approach from the right. The testing putting surface could use expansion to the right, creating hole locations and bringing the greenside bunker on that side into play, but even now it rates stellar. Although playing 171 yards from the back markers, the par-3 fourth at Bellows Falls Country Club appears much longer. What follows is one of the best par-5s I’ve come across in a while, an all-world design—I’m not overstating. Playing 528 from the blue tees, the hole works its way back up the slope that was just descended but in a way that is not laborious. It culminates at a green that surely takes its place among the very best Punchbowls anywhere and immediately reminded me of the green on fourth hole at Dunaverty Golf Club in Scotland, a par-3. The rims of the Bellows Falls bowl are a good 20 feet above the minuscule green. The slopes, which are mowed at the correct height, allow approach shots that clear the apex to make their way to the putting surface. Heck, the second is so good it’s almost worth the green fee just to have the opportunity to play it. 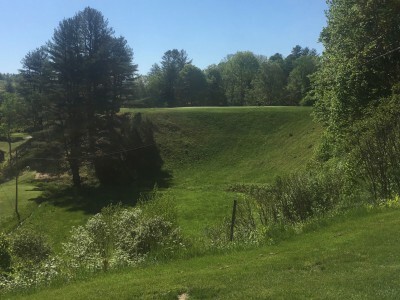 The fourth is a daunting plateau-to-plateau one-shotter that comes in at 174 yards from the back tee and plays over a deep gorge of thick rough. An optical illusion makes the flagstick appear hundreds of yards more away. The sixth and seventh holes are cut from the same cloth. They are par-4s of 368 yards and 326 yard respectively and have their fairways bisected horizontally by a high ridge. Longer hitters, those that can carry the tee ball at least 250 yards, can reach the top shelf. The average player is forced to lay up short of the rough-covered severe rises and play a longer iron into the blind greens. Six offers places to miss on the approach shots but at the seven there is minimal room for error. The eight is the third par-3 and plays 170 and culminates in the most severely tilted green at BFCC. Approximately 10 yards before the putting surface, though, the terrain drops to the green so that tee shots played correctly can land well short and use to the slope to run onto the intended target, vanishing from view before reappearing on the short grass. Here, the front of the putting surface is always a good place from which to take the first putt. Take time after the hole is completed to wander across the cart path and a short way into the woods to hear and see the nearby waterfall, quintessential Vermont. Shortly after The Finest Nines was published, Aetna Springs Golf Course, the ninth-ranked nine-holer in North America, closed. Since then the question has been asked, if the book goes to a second edition what layout would then enter the top-25? I have no answer, as of now, but Bellows Falls would without question receive serious consideration. It’s that good. Go play it.